Our guest this morning is Hanaa Hasan, a researcher and writer at Middle East Monitor, specializing in the Levant and North Africa. She’s been covering several countries in the Middle East for news at the Middle East Monitor, with a focus on Syria and economic issues across the Middle East region. She recently completed an Op-Ed on the US withdrawal from Syria. We’ll also talk about the protests in Sudan, the upcoming elections in Israel, Secretary Pompeo's Middle East tour, and the Israeli airstrikes on Damascus. 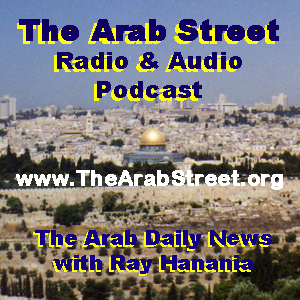 Syndicated columnist Ray Hanania hosts The Arab street radio show on Fridays on WNZK AM 690 radio in Detroit, Michigan. The show is broadcast from 8 AM until 9 AM EST in Detroit live on the radio. Join us at 8 AM IN Detroit, 7 AM in Chicago (online) or in 3 PM in Occupied Jerusalem (online) while we discuss these and other issues during the program. You can also call in to the studio during the radio show broadcast by dialing 248-557-3300. The topic this morning: Do you support or oppose the rumored two-state plan being readied by President @RealDonaldTrump? He is expected to unveil a peace plan to give Palestinians 90 percent of the West Bank to form a State with a sharing of East Jerusalem, although the Old City and the sites holy to Christians, Muslims and Jews would be managed by Israel in cooperation with the Palestine State. The rumored plan would also allow Israel to annex its major settlements, providing land swaps with the Palestinians for the settlement lands lost. Do you support this plan? If you don't support this plan, what is your alternative? Welcome to THE ARAB STREET Radio & Podcast broadcast from Chicago through 690 AM WNZK Radio in Detroit Michigan … Friday Jan. 11, 2019. Joining me this morning is Ali Younes a writer with Aljazeera English and we're going to talk about the case of Rahaf al-Qunun, the young Saudi girl who claims she fled Saudi Arabia through Kuwait to Thailand to excape her parents and family who seh claims were going to kill her because she abandoned her religion, Islam. She bunkered herself in a hotel in Thailand and has asked for sanctuary in Australia. We'll also talk about the election of Rashida Tlaib as the congresswoman representing the former district of John Conyers. Tlaib is a mix bag championing Palestinian rights in the Congress but at the same time she has some faults. Follow Ali Younes on Twitter @Ali_Reports and read his news stories and features at Aljazeera English and also at the Intercept online. THE ARAB STREET Radio & Podcast is a part of the US Arab Radio Network hosted by Laila Alhusini … in an effort to energize and empower Arab Americans to stand up for their rights … go to my website at www.Hanania.com to get information on all my columns at the Arab News in Riyadh Saudi Arabia and at Middle East Monitor on London, England. Our show is available afterwards on podcast on iTunes or by visiting the website www.TheArabStreet.org. Ali Younes, a writer and reporter at Aljazeera English, joins host Ray Hanania, syndicated Op-Ed columnist with the Arab News in Saudi Arabia and the Middle East Monitor in London, to talk about pressing issues including the Israeli-instigated violence in the Occupied West Bank and Occupied East Jerusalem, and the killing many civilians. We discuss how the mainstream American news media empowers Israel to lie about the violence and blame it on the Palestinians while ignoring the violence by the Israeli military and the terrorism of the Israeli settler movement. We also discuss the war in Yemen, and the poor leadership of the Arab World governments and their failure to confront Israeli violence and lies. In the second half of the show, we discuss the BDS (Boycott, Divestment, Sanction) movement and the assault on it by Israel through its surrogate politicians in the United States. 26 American states have adopted anti-BDS legislation and one state, Illinois is moving to sanction Airbnb for delisting Israeli settlements from its online system of advertising homes and apartments for tourist rental. Illinois Gov. Bruce Rauner was booted out of office but has directed the state to sanction Airbnb. The question is what will his successor J.B. Pritzker, an ardent pro-Israel advocate, do? Will he repeal the anti-BDS law which is unconstitutional? Pritzker has appointed many Arab Americans to various boards and commissions and can those Arab American appointees effectively lobby Pritzker to repeal the illegal Illinois anti-BDS law (which violates the U.S. Constitution)? Or, will they ignore the issue. Our guest this morning is Ali Younes a reporter and award winning journalist with Aljazeera English. We're talking about the lawsuit filed by the families of three American servicement killed in 2016 in Jordan, about the murder mystery involving Saudi journalist Jamal Khashoggi, the double standard in America where Americans can vote for a Nazi in an election but they can't criticize Israel without facing punishment in 27 states so far that have adopted anti-BDS laws, and local politics in Detroit and Minnesota where Rashida Tlaib and Ihlan Omar won seats as the first two Muslim Women in the U.S. Congress. Click here to read Ali Younes' reporting in Aljazeera. The Arab street also podcasts special audio interviews when not hosting radio in Detroit on the 2nd Tuesday of every month. Hanania also hosts special editions of the Arab street on Detroit radio on WNZK AM 690 which is produced by ArabRadio.us. My guest for this podcast taped Oct. 18, 2018 is Israeli writer and author Larry Derfner. Larry Derfner was born and raised in the U.S., started his career in journalism in Los Angeles and continued it in Israel, where he moved in 1985, as columnist and feature writer with the Jerusalem Post, and a correspondent in Israel for U.S. News and World Report, and a contributor to the New York Times, Sunday Times of London, Foreign Policy, Salon, The Nation, Tablet, Forward, 972 and many other publications. He is the author of the 2017 political memoir No Country for Jewish Liberals and is currently working on a memoir about growing up among Holocaust survivors, blacks and Asians in early-1960s Los Angeles. He works as a copy editor at Haaretz in Tel Aviv and lives in the city of Modi'in with his family. Remember, you listen to all my podcasts by visiting my podcast website at www.TheArabStreet.org as well as visiting any of my writing websites including my personal website www.Hanania.com also TheDailyHookah.com. This edition of The Arab Street radio features an interview October 12, 2018 with Ghassan Khatib, a former member of the Palestinian National Authority who was involved in the Oslo Peace Accords and is today a professor at Birzeit University. Go to TheArabStreet.org online and get info on the radio show, listen online, buy my new book Yalla! Fight Back, and standup and FIGHT BACK for Arab, Chaldean and Muslim rights … Follow Ray Hanania on Twitter at RayHanania. This edition of Yalla! Fight Back is an audio Podcast interview conducted on Sep. 20, 2018 with guest David Abitbol, an Arab Israeli Jew from Morocco who is the publisher of the popular Jewish blog called Jewlicious.com. Jewlicious is a grassroots organization changing the way young adults affiliate and participate in Jewish life. We support Jewish communities with training, resources, media, informal Jewish education, and events to foster young adult engagement. We develop and utilize networks, programming and social media, to promote creativity, social entrepreneurship, collaboration, inclusiveness and Jewish peoplehood. David and I talk about the things that Palestinians and Israelis have in common and touch on some of the controversial things that keep us apart. We discuss the challenges of overcoming opposition to "normalization" and discuss the real differences between moderates and extremists. Go to YallaFightBack.com and get info on the radio show, listen online, buy my new book Yalla! Fight Back, and standup and FIGHT BACK for Arab, Chaldean and Muslim rights … Follow Ray Hanania on Twitter at RayHanania. Go to YallaFightBack.com and get info on the radio show, listen online, buy my new book Yalla! Fight Back, and standup and FIGHT BACK for Arab, Chaldean and Muslim rights … Follow Ray Hanania on Twitter at @RayHanania. This edition of Yalla! Fight Back Arab radio Aug. 14, 2018 discusses the Arabs of South America and Latin America. There are only 4.5 million Arabs in the United States but there are 32 million Arabs in South America. South America has been more welcoming and supportive of Arab immigrants and Arabs in South America have risen to great business and political heights in Brazil, Venezuela, Colombia, Chile, Ecuador, Argentina, Bolivia. The Arab World ignores the Arabs of America but can they afford to ignore the Arabs of Latin America? I believe we need to do more to explore Arab history in South American countries, and in Central America and even in the Carribean where Arab immigrants have flourished and have great influence. 08-17-18 Arab Radio on Politics: Did Tlaib abandon the Two-State Solution? This edition of Yalla! Fight Back Arab radio Aug. 17, 2018 discusses Rashida Tlaib, the Democratic candidate in the 13th Congressional District seat vacated by longtime Congressman John Conyers in the wake of sexual harassment allegations, and Tlaib's wavering views on Israel and Palestine. Has she really changed her views and opposes the Two-State Solution? Did she surrender to extremist bullies? We discuss that issue and also the oppression of the Israeli government and their interrogation of prominent Jewish columnist Peter Beinart. When Beinart was harassed by Israel's secret police, the Shin Bet, it became major news. But when Arabs, Christians and Muslims are harassed daily, it is rarely reported by the biased and racist mainstream American News Media. This edition of Yalla! Fight Back Arab radio Aug. 10, 2018 discusses the results of the August 7, 2018 Michigan elections with discussions on the performance of Arab and Muslim candidates including Abdul El-Sayed for governor and Rashida Tlaib for the 13th Congressional District seat vacated by longtime Congressman John Conyers in the wake of sexual harassment allegations. This edition of Yalla! Fight Back Arab radio July 20, 2018 features an interview with Dennis Denno a political analyst and pollster who is very familiar with Michigan's election system and many of the candidates. We discuss the race for governor and the leading candidates. We also talk about the candidacy of Arabs, Muslims and Middle East Christians including Chaldeans and the expectancy of voters to support them. Should we just support someone just because they are "Arab" or "Muslim" or "Chaldean" or do we take the bigger picture in mind. A good case is the race for Michigan Governor where there is a candidate who is Arab and Muslim, Abdul El-Sayed, but the question is can he win as the Democrat in a race where a Democrat needs to win to push back against the policies of President Donald Trump? This edition of Yalla! Fight Back Arab radio July 13, 2018 features a discussion on a wide range of topics including on peace in the Middle East, Israel's war on civilians in Gaza, and the upcoming elections in Michigan and Illinois among others and the role of Arabs in those elections.